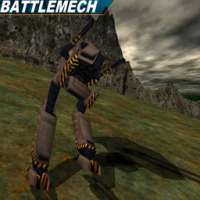 This is an overhead arcade-type stand-alone mod based on the Quake engine in which you pilot a mech from an overhead view in a deathmatch arena. Weapons are scattered liberally about and your goal is to kill your enemies more rapidly than they kill you. Game modes include Deathmatch, Teamplay, Rambo Match, Capture the Flag, Rob the Nest, Protect the Nest, and Infiltration. You can carry only one weapon at a time, but can discard it with the drop button when you find something better. Each weapon has its own strengths and weaknesses. Weapons: Machine gun is the standard weapon, Grenade Launcher, Rocket Launcher, Machvn, Laser Cannon, Flame Thrower, Navin, Homing Missiles, Penetrator, Mines, Laser Mines, Rifle, Shotgun, Burst Flare, Sniper Rifle, Flak Cannon, Namek, Laser Drones, Railgun, Lightning Cannon. Controls - The keyboard layout described here is not written in stone. You can change these buttons to whatever layout suits you best. The up, down, left and right keys (alternate is w, s, a and d) will cause the mech to walk in the desired direction (you can also go diagonally for 8 directions of movement). The head turns and aims independent of the body, and is controlled with mouselook. Moving the mouse left or right will turn the turret, and the speed is determined by mouse sensitivity settings and how fast you move the mouse when turning. You can also use keys bound to look left / right, or a joystick or mouseball. +attack: Fire weapon (default CTRL or mouse1). +jump: Jump (default SPACE or mouse2). Drop Weapon: Drop current weapon (default Enter or mouse3). The mech aims up & down automatically for you, and if autoaiming is turned on, it will also aim horizontally at targets when you are pointed at them. Frikbots are computer opponents you can fight in place of real people. They know the weapons well enough and can kill quite proficiently. Humans are much better though.